HUNDREDS of shoppers got an early Christmas present when they turned out to see boy band 5ive turn on the Christmas lights at the intu Braehead shopping centre. Santa was there with a box of a dozen Krispy Kreme Original Glazed doughnuts for each of the first 700 people at the event. Doughnut aficionados queued to get their hands on the tasty treats, which set them up for an evening of entertainment hosted by Britain’s Got Talent star, Edward Reid. As well as the chart-topping band, 5ive – who have sold 1.5 million albums and two million singles in the UK alone – there were also performances from popular X Factor finalist, Nicholas McDonald along with fellow-Scots boy band, Rewind; heart-throb singer Michael Sutthakorn, from Belfast and Ryan Alexander. And of course, Santa was on hand to help 5ive – Sean Conlon, Ritchie Neville and Scott Robinson – with the countdown to the big switch on of the mall’s dazzling Christmas lights display. There were fun and frolics for the kids from Fun Box and stars of the Braehead Clan also made an appearance on stage. And the party didn’t stop once the lights were switched on, as over at Soar at intu Braehead buskers led a festive sing-along under a giant Christmas tree. Santa’s Elves had already opening the doors of intu Braehead’s magical Santa’s Grotto where youngsters can meet Santa Claus and tell him what they want for Christmas. Marketing manager for intu Braehead, Christine Macdonald said: “We’ve got Christmas off to a cracker of a start and had one of our biggest ever turnouts for a festive lights switch-on. “Everything’s now in place for a fantastic run-in to the big day. The place looks really festive with all our decorations and, of course, Santa’s in his grotto waiting to hear what all the youngsters want for Christmas. 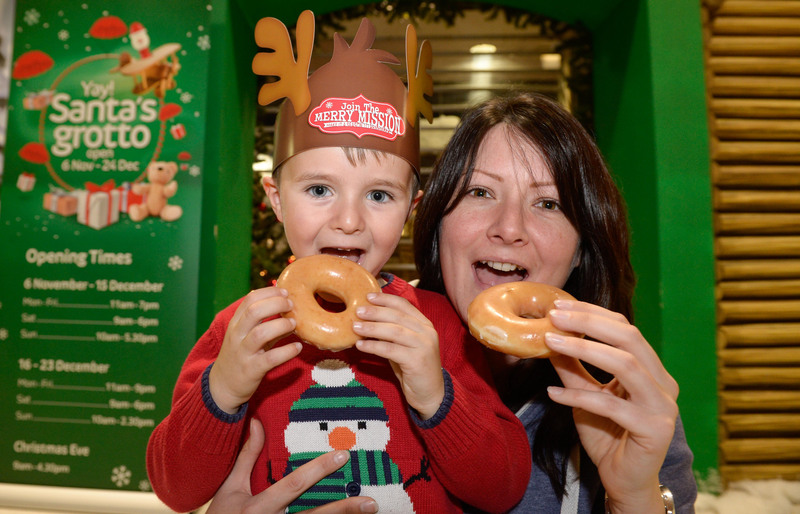 The free doughnuts offer comes only days after it was announced Krispy Kreme is to open a new Hotlight store at intu Braehead, on Wednesday, December 2.